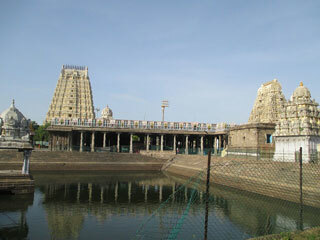 Ekambaranathar Temple (Ekambareswarar Temple) is a Hindu temple dedicated to the deity Shiva, located in the town of Kanchipuram in Tamil Nadu, India. It is significant to the Hindu sect of Saivism as one of the temples associated with the five elements, the Pancha Bhoota Stalas, and specifically the element of earth, or Prithvi. Shiva is worshiped as Ekambareswarar or Ekambaranathar, and is represented by the lingam, with his idol referred to as Prithvi lingam. This article uses material from the Wikipedia article "Ekambareswarar Temple", which is released under the Creative Commons Attribution-Share-Alike 3.0 License.